I promised more on my experience at Heroes Con, and here it is! Though I've read other accounts that are far better... But here we go. Rod and I left the house late on Thursday for the seven-hour trek to Charlotte. Rod had put in to take Friday off of work a couple of months ago, but things came up and it looked like his boss was going to make him come in on Friday regardless. Which meant that I would be driving down to NC by myself, and Rod would follow Friday afternoon by bus. Then I'd have to pick him up at the bus station in Charlotte at around 2 AM Saturday morning. I was not looking forward to that. But as luck would have it, things worked out and Rod was able to take Friday off after all. So after Rod got home from work, we headed out the door. The drive was mostly in the dark, and we passed some wicked thunderstorms as we went through Virginia. At one point it was raining and hailing so hard that I thought I might have to pull over. But, being the daredevil I am (not), I decided to stick it out. We arrived at the Hilton in Charlotte at around 2 AM Friday morning and crashed. 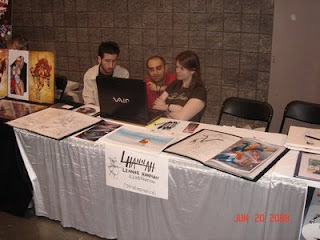 Friday morning we made our way into the convention center and found our table and scurried to set everything up. Since this was really my first time having my own table (the last time I was part of a booth was when I was with MVCreations years ago), I wasn't sure what to expect. 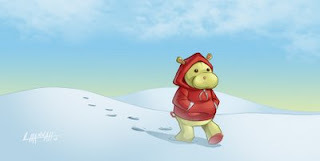 I had made up some prints of a drawing I'd done of my stuffed animal Hippo walking through the snow, and set those out along with some samples of my work and sequential pages. 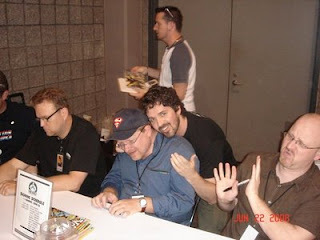 Next to me was inker Bill Meiggs, and on the other side sat Scott Weinstein and Gino Patti, who were promoting their book After School Agent (which is a fine read, I must say!). I couldn't have asked for better booth buddies-- they were all great guys and very friendly. Compared to most tables around me, mine was pretty bare, but hey, I'm chalking this up to a learning experience. Everyone around me made me feel very welcome, and that helped a lot towards getting over my initial nervousness. On Friday I was basically getting a feel for everything and stayed at the table most of the time (chatting with people and looking at Emiliano Santalucia's secret Masters of the Universe photos/concept art on his laptop with my pal Jon) while Rod walked around. At one point Todd Dezago came up to my table and handed me a copy of the Mike Wieringo tribute sketchbook, thanking me for contributing the piece I'd drawn and sent him. He wouldn't let me pay for a sketchbook, and I felt bad about that because I had been planning on buying one or two. I am always shy at these cons to begin with, but get warmed up as I go and get a feel for things. I think Rod had gone up to Todd and told him that I would probably be too shy to talk to him, and that's why Todd came over. And he was probably right, but still... 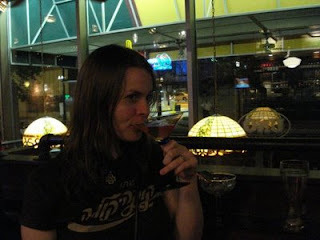 It was a nice thing to do, and afterward I was completely fine with going over to Todd's table and talking to him. Todd had invited Rod and myself to go to the tribute dinner for Mike at Fuel Pizza on Friday, but we got out of the con so late that day that by the time we got to Fuel the place was packed (I wanted to kick myself for that). So we ended up going to Uno Pizza instead and I don't think we left until after midnight. The next day was very busy. Almost right after the convention opened I got my first commission request from a little girl. I was charging for commissions, but couldn't bring myself to do it in this case. I ended up drawing a Spider-Man that I wasn't really happy with. But the girl seemed to really like it and she said she was going to put it in a scrapbook with a bunch of other commissions she'd gotten-- apparently she's been doing this for years. 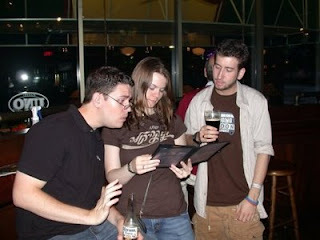 That sounded really cool, and I told her that I would look forward to seeing the scrapbook at next year's con. I got another few commissions on Saturday too (including the ones I posted a couple entries ago) and started getting a little better each time. At least I think so. I always find something to pick out that I'd love to change no matter what I draw. During the con I saw a bunch of pretty cool costumes. 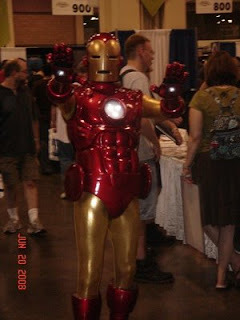 My favorites were an awesome Iron Man (with light-up hands and chest!) 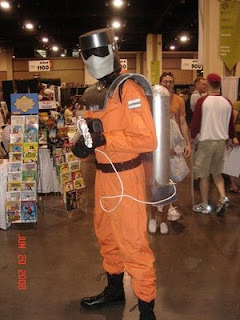 and a guy who had dressed up as Barbecue from G.I. Joe. As soon as I said, "Look, it's Barbecue!" he turned around really quickly and posed for us. At one point I finally made my way over to the table Matt Wieringo and his wife Suzanne had set up where they were selling some of Mike's pages and other things-- all proceeds went toward The 'Ringo, the scholarship fund Matt set up in Mike's name. 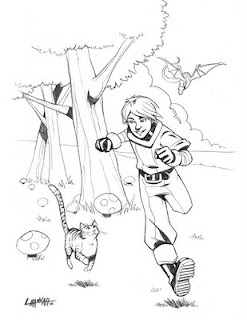 I was flipping through Mike's beautiful comic pages and recognized so many of them from the comics I read as I was growing up, and I was planning on definitely buying at least one page (probably a Robin) when I came across one of Mike's warm-up sketches towards the back of the book... and I knew I wanted it if it was for sale. To me, it meant more than a comic page. 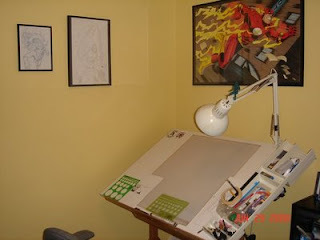 I always loved the sketches Mike would post up on his blog, and would often pour over them when I needed inspiration for something I was working on. Matt was gracious enough to sell it to me, and as soon as I got home I bought a frame for it (and the Flash poster I bought) and hung them both up next to my drawing table at home. 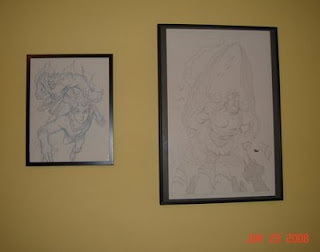 The warm-up sketch I hung up next to the framed Stratos drawing Mike had done for me a few years ago, back in the MVCreations days. Incidentally, whenever I pulled out the warm-up sketch I'd have to give myself a good 5-10 minutes to just stare at it. I love looking at the blue pencil roughs, half-erased lines and finished pencil marks. I can't help it, I love that stuff. After I bought the sketch from Matt, I also donated again and got a sweet Robin sketch from Randy Green. Towards the end of the day on Saturday, Val Staples came over to me and said that the Hero Initiative folks were looking for me, and that they didn't realize I was at the convention and wanted me to sign at the What If? panel on Sunday. I was floored-- why would they want me to sign with everyone else? I had done color assists on the issue, but... I somehow didn't think I was important enough to be sitting there with all of these big-name guys. 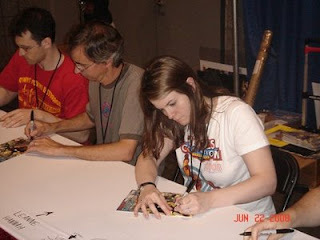 But Sunday rolled around and I did go to the Hero Initiative booth where tables were set up for the signing. 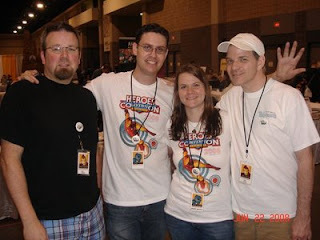 I was introduced to a few of the guys there-- Ethan Van Sciver (who had been signing there before I arrived), Mark Waid, Jeff Parker, Richard Case, etc., and they were all very friendly to me. It made me feel more at ease, but still... I couldn't help but wonder why I was there. I also felt kind of strange because I didn't work on the issue to get recognition-- I only wanted to be involved because it was Mike's last project and was paying tribute to him. But it was still a very neat experience and I forgot about my worries once we started signing. The books started coming down the table and it turned into an assembly line, so it was all I could do to try and keep up. So, aside from all that, one of the other things I did was walk around and talk to a few artists to get some feedback on the batch of What If? sequential pages I'd done. I had some really nice feedback from Laura Martin, Michael Avon Oeming (who I discovered is a fellow Blake's 7 fan! ), Bryan J.L. Glass and Stuart Immonen. It was interesting hearing their comments-- some of them were contradictory depending on which style(s) each artist preferred. Still, it was interesting and opened my eyes to a few things I can improve upon. No one really had anything horrible to say about my portfolio, which surprised me, frankly. I was constantly waiting to hear someone tell me that I had a lot of work to do or things to brush up on. But it didn't happen. I am still stunned about that. Maybe they were just being nice. So on Sunday towards the end of the con, Rod and I packed everything up and started to head out. We were trying to leave a little bit early because of our long drive home and the fact that we both had to be at work early Monday morning. But as we were walking out we swung by Todd's table to say goodbye to Todd and Craig and got a photo (and a photo of Nick Cardy's hand to boot). So we started to walk toward the doors to exit when I finally spotted Brian Stelfreeze at his table. I'd been trying to track Brian down most of the con because I was told that he was the guy to go to for a portfolio review. He would give it to me straight and tell me whether or not I was a crap artist, basically. So as I approached him, I was wondering to myself, "Well, I've had a great time at this con... Is this the part where I completely have my art ripped to shreds and Heroes ends on a down note?" But my legs carried me over to Brian and I asked for a portfolio review. He was very nice and started to look over my stuff. And I swear, it was suddenly as if I was talking to an art master. He started telling me these deep, informative things about storytelling, finding my own style and not letting the writer dictate everything in a story. It was brilliant. I could have sat there and listened to him go on for hours. So finally he starts really looking at my stuff and I brace myself for the worst. But it doesn't come. Instead, he gives me a few pointers and then tells me that he really likes my stuff. And I'm stunned. Even more so by the next comment. "Who are you working for?" he asks. "Um... No one," I respond. "Are you serious?" he asks. And I just nod my head and probably look like an idiot. He gave me a few more pointers and after I thanked him profusely for taking the time to look at my work, he tells me to keep in touch because he wants to see where I end up. He thinks I'll "go places." Crazy. So Heroes Con went out on a definite high. But besides that, I really had a fantastic time. I've been to a few conventions over the years, but Heroes has been the best, I think. It was such a relaxed and friendly atmosphere. I met some wonderful people, made a few new friends, caught up with old ones and finally gained some confidence in my art. But you'll still never hear me say anything I draw is good. Well *I* think your art is fantastic :D As soon as I get a frame for my Hippo print, he's going up on my wall!